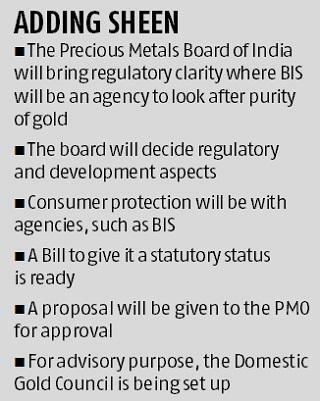 The finance ministry has given its nod to set up a precious metals’ board to bring clarity on how the new comprehensive gold policy will be implemented. The proposed board, to be known as the Precious Metals Board of India, will be the regulatory body for gold, silver, platinum, palladium and other commodities the government notifies. During a meeting of government officials and industry stakeholders in New Delhi, the plan to set up the board was finalised and a proposal on this will be sent to the Prime Minister’s Office in a day or two, said a source. The board is expected to have a chairman, two whole-time members, two part-time members from the finance ministry and one member each from the Securities and Exchange Board of India (Sebi), the commerce ministry and the warehouse regulator. The plan to constitute such a board was under consideration for long. The finance ministry had set up a high-level panel to discuss its formation. The panel included representatives from Sebi, Bureau of Indian Standards or BIS, the India Gold Policy Center (set up by IIM-A), bourses and the World Gold Council. Its first meeting was held on December 27. A panel headed by NITI Ayog member Ramesh Chand on spot and futures trading had proposed a separate regulator for spot trading. Another NITI Ayog panel on gold policy had also proposed the setting up of a gold board but as an advisory body. The proposed body is likely to be formed on the lines of the Ramesh Chand Committee. The board will be set up after passing an Act in Parliament. Till that happens, a transitory arrangement will be made by the ministry and the board may work as a division of the Union Ministry of Finance. In the past, regulators like the Forward Markets Commission, Controller of Capital Issues and even Sebi were set up under the jurisdiction of their respective ministries. Initially, the board will start preparing a road map for implementing the gold policy. It will be deciding details for launching gold contracts on the proposed spot exchange and modalities for setting up the exchange. It will even take a call on regulating bullion refineries and vault service providers. Bullion banking will be another area in which the board will decide details, said the source. 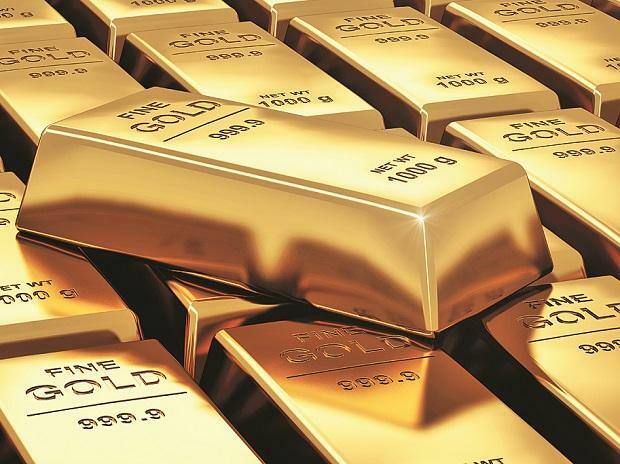 Bullion banking is to introduce financial instruments and link them with gold. The board will be subject to audit by the Comptroller and Auditor General or CAG and the board’s decisions can be challenged in the Supreme Court. Bullion refineries are now fulfilling 50 per cent of the domestic refined gold demand but they are not regulated. BIS is the licensing authority for them and its rule is to ensure purity and check processes. However, a need was felt since long to regulate bullion refineries for which the board will prepare broader guidelines and regulations. The proposed board will be the regulator for refineries and even vaulting services. Since the board will also regulate spot exchanges for trading in precious metals, it will also regulate other intermediaries like repositories (record-keeping agencies) and the clearing corporation (for clearing and settling trades on the exchange).